Whether you’re looking for a way to keep your kids’ brains from shrinking over or if you’re in need of something year-round that can provide a quick brain workout when you have a few minutes to kill, this gaming app that we’re about to share is for you. It is called Math Brain Workout, made by Piney Games and compatible with all Android devices, both phones and tablets. It has friendly and smooth user interface and it is filled with fun features. The gameplay of Math Brain Workout is addictive and challenging. This means you will be hooked up immediately. Your mission is to calculate addition, subtraction and multiplication sums as fast as you can and make higher scores. 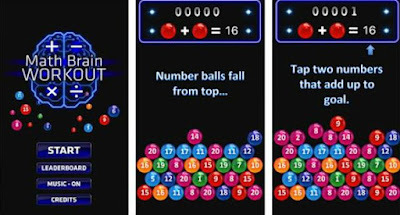 You will have to think and tap on two numbers on the stack of balls and obtain the answer shown at the top of the screen. As you play, it will get more and more difficult, meaning the balls with number will keep falling down faster and faster, so yes, it is quite a challenge! Try to show your math skills and put them to a test, make higher scores and compare them within the online game leaderboards. Download Math Brain Workout from Google Play, where it is available completely for free.